The world is prepared for the dawn of the Internet of Things, starting with smart home devices and control systems. Google is betting heavily on IoT, which was apparent from its acquisition of Nest, a company that makes smart home devices. While the future of a completely self-reliant home may be a few years away from reality, Google has already integrated the Android OS with Nest thermostat. If you own a Nest thermostat and belong to the Android master race, it is time you start to control Nest with Google Now voice commands. Nest installed and properly set up at your home. The official Nest app set up on your device and configured with the Nest thermostat. Since Google owns Nest entirely, the company has made it quite easy to integrate their two technology services online. Start off by visiting the Work With Nest website on your desktop browser, where you will be able to add your Nest devices with Google Now voice commands support. Under the first section you see on the web page, go ahead and click on “Yes, I’m In” and you will be redirected to enter your Google account password. Once you have completed the setup, your Nest device at home will be controllable from anywhere using Google Now voice commands. With all the perquisites out of the way, you can start using the “OK Google” voice command to trigger actions on your Nest device a home. You can open Google Now and look at the current home temperature, and on your way home, you can say “OK Google, set the temperature to 75 degrees”. 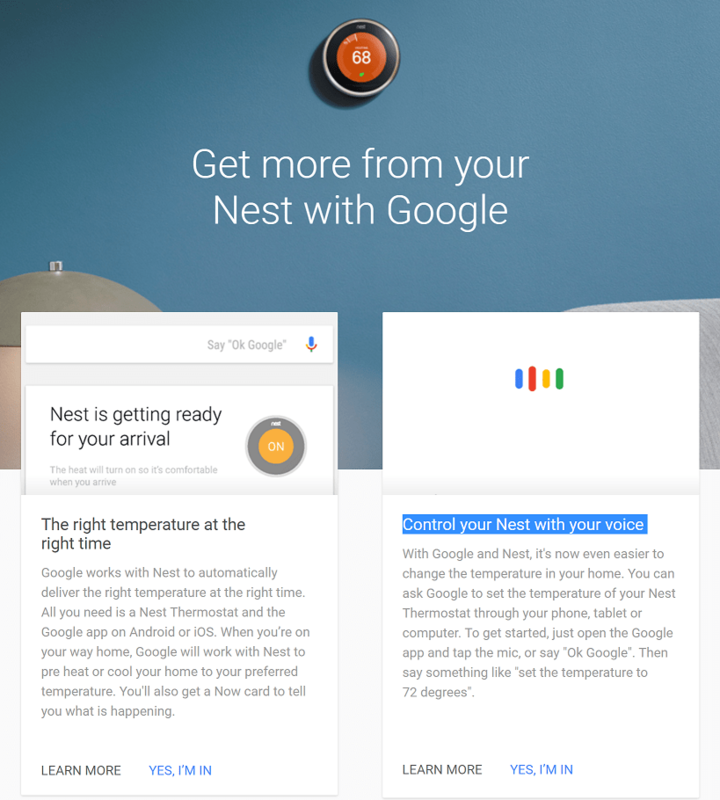 There are dozens of more commands that you can use with Nest when connected to Google Now. Here is a list of all the commands that you can use with the app, so do be sure to let us know your experience while using Nest with Google Now voice commands.